Who? I am a female solo performing and recording artist with over 35 years experience in music. What? I sing and play acoustic, alternative and traditional rock, folk, blues and pop songs on a Breedlove guitar, with a TC-Helicon VoiceLive component that allows me to mult vocals and sing live harmonies with myself. My repertoire includes cover songs from the 1950s to modern day and original songs. Why? I can fill a room with live serenades that will engage you and/or keep you entertained, whether it's a big event in a large space or a casual party at your house. 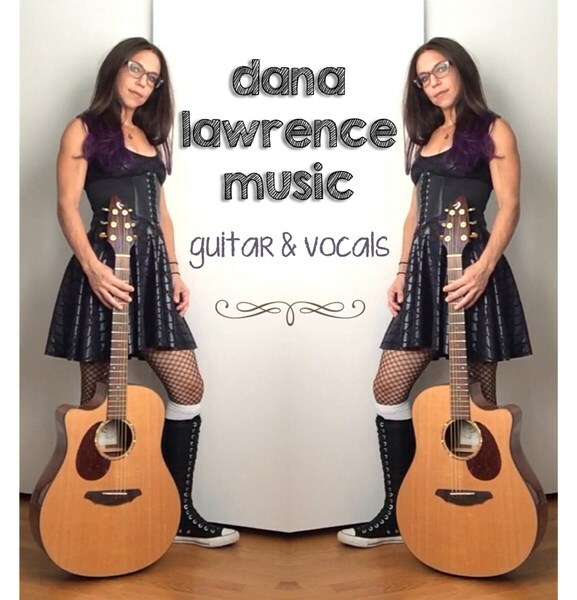 The Chicago Tribune writes: "Sporting Woody Allen glasses and Chuck Taylor gym shoes, singer Dana Lawrence Gillis pulls listeners in with a dazzling smile and heartfelt lyrics, driven by blazing riffs on her acoustic guitar. At 5-foot-2, Gillis is younger (39) than her Woodstock-era, long brown hair might suggest. An educator by day, she has performed in Chicago and North Shore venues for more than 20 years. Music and elementary education are her passions. She and fellow teacher Ellie Rubenstein started t2 a tutoring center in Highland Park for K-12 students. Music plays a role in classes at t2, and Gillis and Rubenstein even created a catchy rap video about the scientific method for classroom experiments, which has more than 400,000 views on YouTube. Besides music, Gillis is also into fitness, circuit training, distance running and martial arts. She and her daughter, 6 — whom she calls 'The Mini' — share a love of sports, music, language and martial arts. 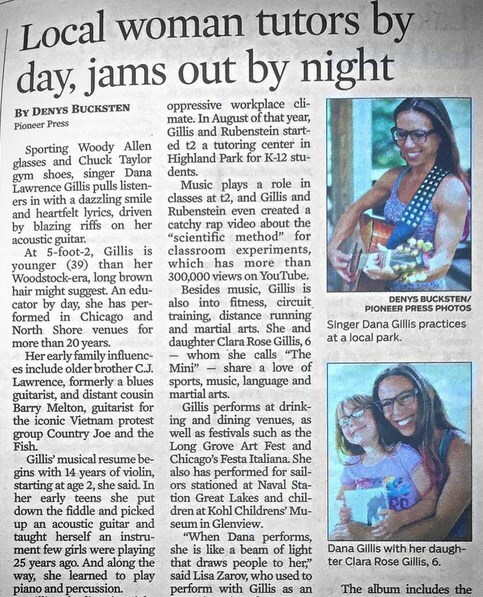 Gillis performs at drinking and dining venues, as well as festivals such as the Long Grove Art Fest and Chicago's Festa Italiana. She also has performed for sailors stationed at Naval Station Great Lakes and children at Kohl Childrens' Museum in Glenview. 'When Dana performs she is like a beam of light that draws people to her,' said Lisa Zarov, who used to perform with Gillis as an acoustic guitar duo. Zarov, now a licensed clinical social worker and therapist with a practice in Deerfield, said Gillis stands out because she's always prepared. 'She practices and is detail oriented — which in the rock world is sort of unusual,' Zarov said. Please note Dana Lawrence will also travel to Highwood, Fort Sheridan, Deerfield, Glencoe, Northbrook, Lake Forest, Techny, Lincolnshire, Winnetka, Carol Stream, Glenview Nas, Buffalo Grove, Glenview, Kenilworth, Wheeling, Golf, Lake Bluff, Prospect Heights, Wilmette, Arlington Heights, Des Plaines, Evanston, Great Lakes, Libertyville, Morton Grove, North Chicago, Vernon Hills, Mount Prospect, Niles, Skokie.